Pelvic MRIs can look specifically, at rectal, bladder, or prostate cancers. These specialized exams can evaluate pain that is otherwise, unexplainable. In males, the pelvic MRI could be evaluating the prostate or testicles. 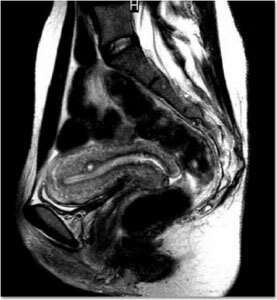 In females, the pelvic MRI is looking more closely at the uterus, cervix, and ovaries. These tests could be ordered to evaluate and diagnose tumors or cysts, diseases in the pelvic area, infertility, and causes of pain, such endometriosis, adenomyosis, and fibroids. For further explanation of what your physician is looking for, please consult your physician. Information provided by GE Healthcare, www.gehealthcare.com, and Radiology Info, www.radiologyinfo.com.